ended up with a question about books instead. Have you ever read Tim Powers’ early novel “The Drawing of the Dark”? ALAN: Indeed I have. It was the first Tim Powers novel I ever read and it turned me into a huge fan, mainly because it was about beer, of course. Unfortunately, much as I love his books, I’ve found all his other novels to be vastly inferior to “The Drawing of the Dark.” No beer! Actually that’s not true. Many of Powers’ novels do feature beer but not to the same extent as in “The Drawing of the Dark” where the lore of beer is central to its plot. And don’t forget, I’m English – beer is our national religion. How could I help but love the book? JANE: I had the funniest initial encounter with “The Drawing of the Dark.” I was still living in Virginia and one of my gaming group members – Bill Tedder – came over. He was reading this cheesy-looking paperback while we waited for the others to arrive. The title was in brilliant yellow highlighted with orange. The art showed a white haired man in a vaguely medieval outfit battling a gargoyle wearing nothing but a pair of very brief briefs, platform shoes (no kidding), and tribal tattoos. The title didn’t raise my estimate one bit. “The Drawing of the Dark” seemed like the title of the worst of bad heroic fantasy. When I said as much, Bill just grinned and said something along the lines of “Give it a try. You might be surprised.” He loaned me the book then and there, since he’d read it before. Boy, was I surprised! The “dark” turned out to be dark beer and the tale itself a convoluted saga of reincarnation entwined with the myth of the Fisher King. I loved it. 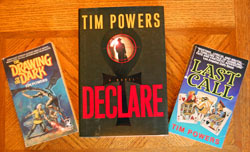 The book made me an avid reader of Tim Powers’ work. ALAN: What a strange coincidence! I also found the book in an odd way. One weekend I was terminally bored. I’d completely run out of things to read. I popped down to the corner shop to buy some milk. The shop had a very small collection of books for sale, perhaps a dozen or so. They all looked like utter rubbish, but I was desperate for words so I grabbed the only one that looked even vaguely SF/Fantasy oriented even though I’d never heard of the author, and I took it home along with the milk. It was, of course, “The Drawing of the Dark” and the weekend quickly stopped being boring as I raced through the book, chortling at all the lovely jokes and reveling in the complex plot. Before we go further, I’d going to nod to those people eavesdropping on our conversation and try to explain what type of novel Tim Powers writes. I suppose a definition would be “alternate history fantasy,” but Powers manages to do something more. After reading one of Tim’s books, I become convinced that his version of history is the real one and the stuff in the history books is missing crucial details. ALAN: Yes – it’s that verisimilitude that gets me every time. His novel “The Anubis Gates” is a time travel story in which a group of scholars travels to early nineteenth century London to attend a lecture by Samuel Taylor Coleridge. Things go wrong and they end up stranded. Along the way they encounter the famous poet, William Ashbless. The plot is extremely convoluted and the evocation of bizarre London lowlife is brilliantly done even though it bears no relation to reality whatsoever. I was so drawn into the book that by the end I was absolutely convinced that Ashbless was a real poet and I was gobsmacked when I eventually found out that Powers had invented him. But my very favourite of his novels (after “The Drawing of the Dark,” of course) is “Declare.” The novel is about the life and times of Kim Philby the infamous Soviet spy. He’s a legendary figure in England – Burgess, MacLean, Philby and Blunt, the so-called “Cambridge Spies,” have all entered the folklore. Powers manages to breathe new life into the legend and the very twisted supernatural ending of the novel is a tour de force. My least favourite of his works is “Last Call.” I really don’t enjoy it at all, mainly because all the way through I felt that things were going on under the surface that nobody was telling me about. All the characters seemed to know stuff that I didn’t know, and none of it was ever explained. I spent the entire novel feeling bewildered and frustrated. For once, Powers’ talent for sucking the reader into the world of the novel deserted him. It’s the only Tim Powers novel that I failed to finish. And I’ve read all of them, including his very early and very hard to find stuff. JANE: Interesting how different our reactions were. As I was saying, I always came away just a little disappointed from a Tim Powers novel. Then came “Last Call.” Now, my disappointment wasn’t because the books were bad – indeed, a flawed Tim Powers novel was, for me, still far better than most of the stuff being published. It was because I felt Powers wasn’t carrying his idea through all the way. There would be a problem with pacing or an issue too easily resolved (or not resolved at all). Then I read “Last Call.” It’s a complicated story, touching again on some of Power’s favorite themes, interweaving old myths, magics, and legend into – in this case – a contemporary setting. I liked the main characters and felt they were better fleshed out than many Powers had written in the past. By coincidence, I was reading “Last Call” to keep me occupied on my flight to a World Fantasy Convention. It’s a long, complex novel, and so I didn’t finish it. I kept sneaking time between events to read it and even brought it along to the banquet, hoping to find a moment between speeches to finish. I was attending this banquet as a Avon Books author and so was Tim Powers. I’d met him a time or two before and, since I had his book in hand, I started telling him how much I liked it. I was particularly concerned about the fate of the character Arky. I remember telling Tim that it wasn’t that I was hoping for a miracle cure for Arky’s cancer (which had been Arky’s goal at the start of the novel), but that I hoped, if he had to die, he’d go out well. Then I realized that this book was a keeper, so I asked if Tim would sign my copy. He did so, writing as follows: “For Jane! – Hoping you approve of how Arky turns out – & (- just between you & me -) I hope that, an hour from now, this has won the World Fantasy Award. Cheers, Tim Powers”. Hard as it may be for those of you who follow these things, I hadn’t realized “Last Call” was on the awards ballot. As I quickly scanned the program, I realized that there was a strong group of contenders that year. “Last Call” was definitely not a sure fire to win. When the time for the novel award came, my heart was pounding as hard as if one of my books was on the ballot – I mean, how could I have been such as idiot as to be nattering away at an author who was hoping his book might win? What would I say if it didn’t? I sneaked a glance over at Tim and found him watching me! Would you like to hear my theory why? This entry was posted on September 15, 2011 at 1:00 am and is filed under Thursday Tangents. You can follow any responses to this entry through the RSS 2.0 feed. You can leave a response, or trackback from your own site. My introduction to Tim Powers came from “Anubis Gates,” closely followed by “On Stranger Tides.” Oddly, I’m not as fond of “Drawing of the Dark,” as either of you are, but “Declare” was certainly fun to read. Pirates! You can never go wrong with a story about pirates. I hope Tim Powers got lots and lots and lots of money when he sold the movie rights. It’s probably my third favourite of his books. I’ve never read Tim Powers, but your comment, “After reading one of Tim’s books, I become convinced that his version of history is the real one and the stuff in the history books is missing crucial details.” sure makes me want to! Sounds like Drawing of the Dark is the place to stat. I love, love, love LAST CALL, but now I’ll have to read DRAWING IN THE DARK. I am also a fan of warm Guiness, having gone to university in Lancashire for a year. @ Alan, do you have a favorite dark brew, or are you a general enthusiast? @ Jane, if I recall, you are not beer drinker, but you’ll have whiskey when you’re fighting a cold? Do you have a preferred whiskey? I’m very glad you drink your Guiness at the proper temperature! You lose so much of the taste if you chill it too much. It is, without doubt, the very best of the dark beers. But if you ever come to New Zealand you really must try Emerson’s Stout – it’s a beautiful beer, full bodied and smooth. Go to bed with a bottle of whiskey and a hat. Hang the hat on the bedpost and drink some whiskey. Drink some more. When you can see two hats, you aren’t cured, but you feel a lot better! I don’t really drink whiskey, even when I have a cold. However, I have been known to have a rare hot toddy with a splash of whiskey when I’m sick.